After a “I hear Kep is supposed to be nice” comment from fellow traveller Raf, we were on a bus to the little coastal town, not far from Kampot in Cambodia (where loads of pepper is grown). Once we arrived we secured a bamboo hut on the hill side (they were pretty comfortable, though electricity only came on from about 5pm), with a beautiful view of the bay. We rented a couple of bikes and along with our friend Raf we scouted out the local area. Kep, once a popular resort area until the Khmer Rouge came along and forced everyone out, it now had an air of abandonment; but not it a trashy way, just reclaimed by nature and time. The old fancy broad-walks along the coast, now cracked and grown over in some places, coastal homes lay gutted. Though next to all this decay there were also a few wonderful local restaurants and newer resorts (like our own). We stopped to try the local crab (which the area is known for), and did not regret it. We ate peppered crab with pepper from down the road and crab not more that 30M from where we sat and ate on the shore. The next day, feeling energetic we set off with our bicycles once more in an attempt to find more old abandoned houses whilst we circled the hill which a part of Kep sat on. We cycled for miles through the most beautiful countryside. 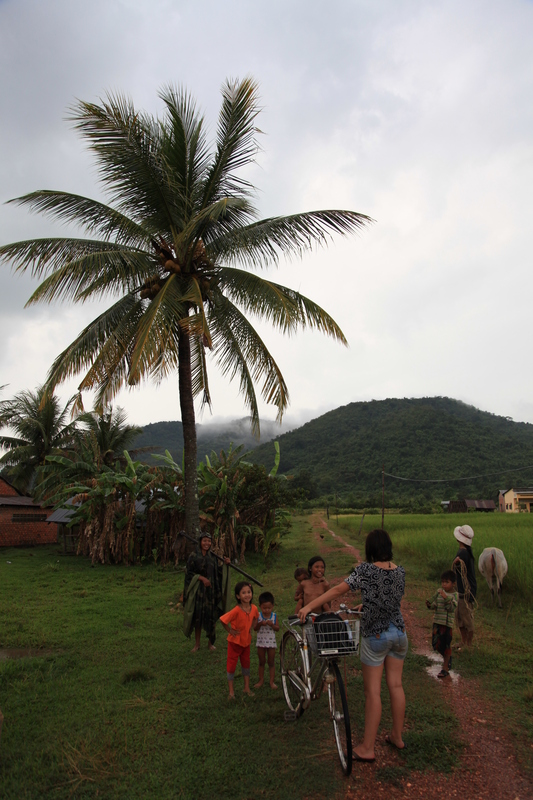 Passing locals retrieving mud from the river (not sure either…) and field after field of rice. Stopping here and there to say hello to the local children of picking up playing cards (once again not sure either… ask Clare). As we doubled back to round the other side of the hill, we happened upon a mosque almost in the middle of nowhere. It looked pretty incredible against the swirling skies of an ominous looking storm. 2 Minutes up the road we ploughed into the nearest restaurant/cafe/shop/thingy at the side of the road, rain just on our heels. As we propped our bikes up and ran under the tarp that was the front of the shop thing, the heavens opened. I know! I know! Its a massive cliché, but there really was no other way to describe it. SO MUCH WATER FROM SKY! We sat and ate some chewy fried things and nibbled on some hard cinnamon baked things whilst we waited, watching the road become a river. After a surprisingly short time the rains just stopped and on we went. 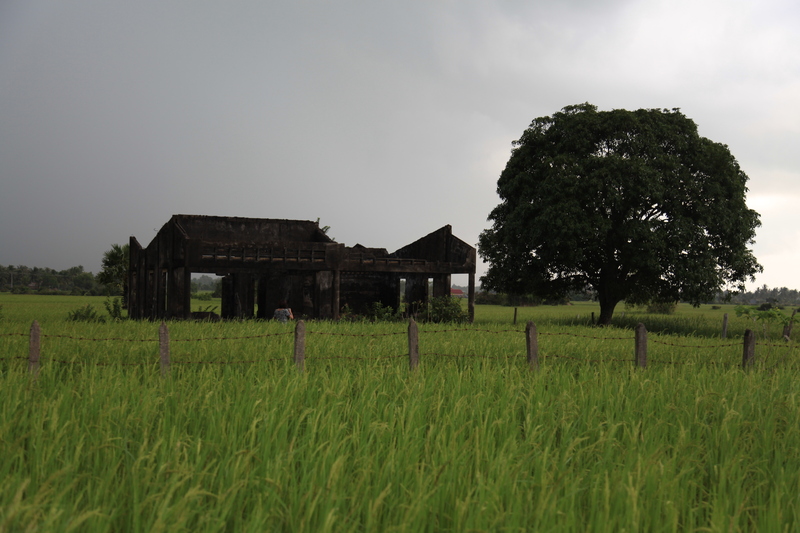 We cycled only a short distance and discovered an amazingly blackened building in the middle of a luscious green field of rice. We all stopped to take pictures and after a minute we realised how quiet and peaceful it was around there. Well, not entirely. “What’s that sound?” Raf asked. We grabbed our bikes and peddled as fast as we could in the direction of the nearest building, which happened to be a farm house with a pig-sty next to it. Not seeing anyone in the house we ran for the iron lean-to that was the sty. And then the rain fell, heavy as before, soaking Clare to the bone as she was a little way behind us (she had gone up to explore the building). Eventually the rain slowed enough (the owners of the farm house had seen us standing in the sty) and we we’re invited into the farm house. It was an incredibly humble home, with dirt floors wooden beds with no mattress only mats and a barrel in a back room for washing. We spent quite some time in there, waiting for the rain, in the warmth of the simple home. We made the time pass by trying to bridge the language barrier; playing with the children (Clare teaching them yoga and getting them to play ‘Simon Says’ which was more like ‘Copy Clare’), drawing pictures in a little note book, teaching the kids to count in English and showing photos from our camera’s. I don’t think I have felt that welcomed by strangers in a long time, though there was no common language and we had nothing to give to them in the way of thanks, we really did feel so welcomed. Eventually the rain let up and we left, waving and shouting “Ar Kun” (thank you). After a short ride we finished the circle, to climb the guest houses hill once more, arriving exhausted and sweaty. Arriving in monsoon rain at Mue Ni beach, we walked the 3km in the rain and with the absence of a real umbrella or any kind of water-proof we fell into our room thoroughly soaked. Hopping in an old white Chinese 4×4 we raced off towards the dunes with the 4 other people +driver, stopping along the way at a local fishing port (which stunk, but strangely not as much as the roads leading out of the village, mainly due to the two lanes of drying fish on either side of the road). After longer than we thought and further in land than I would have guessed, we arrived at the white sand dunes. Sadly the 4×4 seemed purely for show and couldn’t be taken on the dunes (which made the ‘guide’ with his added lack of English, more of a driver than anything else). 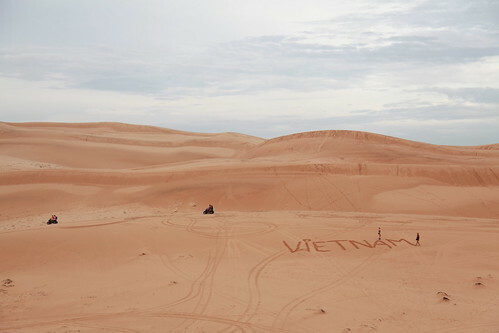 We hired two sheets of plastic for 30,000 Dong each (£1, sneaky) and made our way up one of the steeper looking dunes. The incredible thing about the place was its surroundings. In one direction you looked and saw miles of desert dunes, look to your left and you would see a large lake with green plants growing on top, to the right fir type trees on sandy and grassy hills. We decided to use our bit of plastics to sand sledge down the hill, after a few failed attempts we got quite some speed up. The only problem was steering and breaking. Steering was impossible, and breaking involved falling off sideways and rolling a bit. Clare decided to try it from one of the highest points and got up some amazing speed (video to come). I decided to try it with an air of cockiness (“That looks like fun, I’m SURE I could do that” I thought). I went about 40 meters, hit top speed, one foot went to the ground the other in-between the rope attached to the plastic sledge and then I was in the dune. Hair lolling around in the sand, grit in my teeth and in my shorts. After spending around 1 hour 1/2 of our allocated 40 minutes we returned late to the 4×4 (people waiting unhappily for us, sorry!). 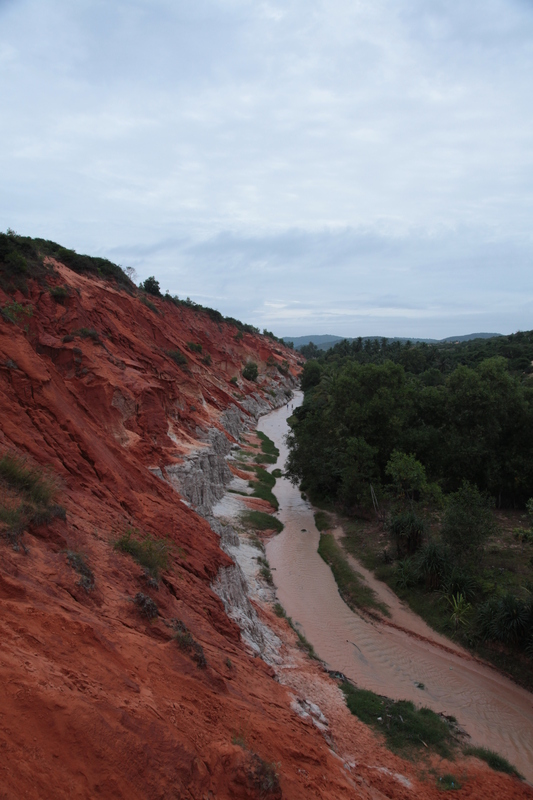 The rest of the tour consisted of a dune of red sand that was covered in locals/tourists/litter and the incredible “fairy spring” (hums a tune from Zelda). So, after some research we finally figured out that you can actually go to Halong Bay without paying at least $60 for one day. We took a bus-boat-bus from Hanoi which left around 1:30pm, this meant we got to Cat Ba town after dark. This was one of the most disappointing experiences (except for Thakhek in Laos). 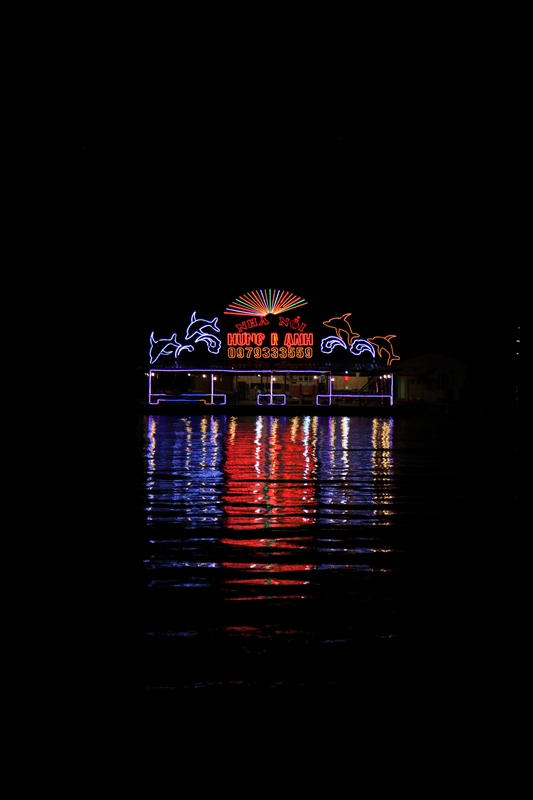 We expected a little untouched island, we got Blackpool… Glowing neon floating restaurants, a sea front covered with hotels and a great big glowing arch thing with “Welcome to Cat Ba” in LED lettering. Needless to say we felt conned, not necessarily by anyone but by what we expected.We checked into a hotel feeling disappointed and hoping that the view in the morning might change. The next day things did start to look better; the view from our room was pretty nice. A short walk to one of the nearest beaches and we had come back round to loving the place. Beautiful sandy coves, huge slate cliffs with green vegetation covering the tops and more islands and mountains in the distance slowly fading into the monsoon mists. There was a cliff edge walk way leading from one beach to the another, but sadly years of bad weather had collapsed and rotted through it, but it made the beach feel slightly more atmospheric. There was also a cliff top path leading round one of the headlands. 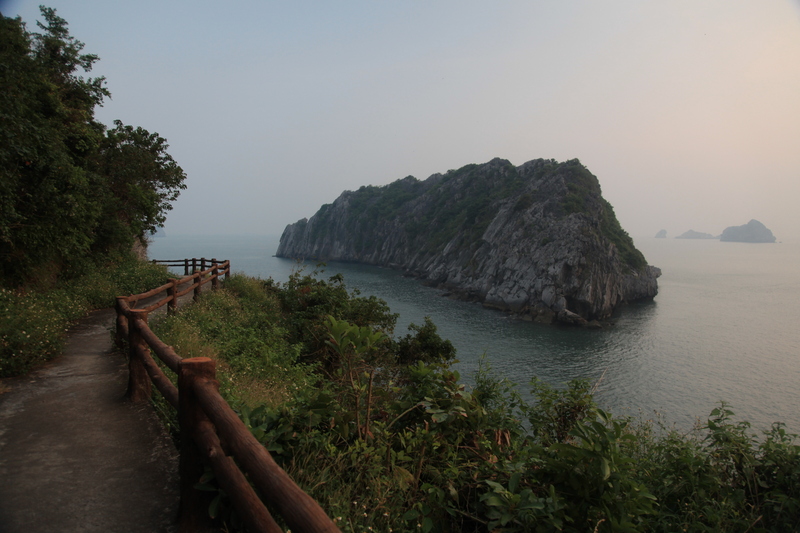 We followed the trail and each turn made us more exited with the beautiful views of Halong Bay. As we made our way back towards the hotel the sun had begun to set. Unfortunately the sun set behind a far off island and we couldn’t see it go down. But then, slowly at first, the sky began to change. The sky over the harbour became a surreal pink and purple, the water reflected this and changed too, whilst the boats became surreal silhouettes against the cut-out islands. It really was one of the most surprising and unreal sunsets I have ever seen. The next day, inspired by what we had seen, we set off on a motorbike to explore the rest of the island. Once again we were surprised by each turn of the coastal cliff-top road. 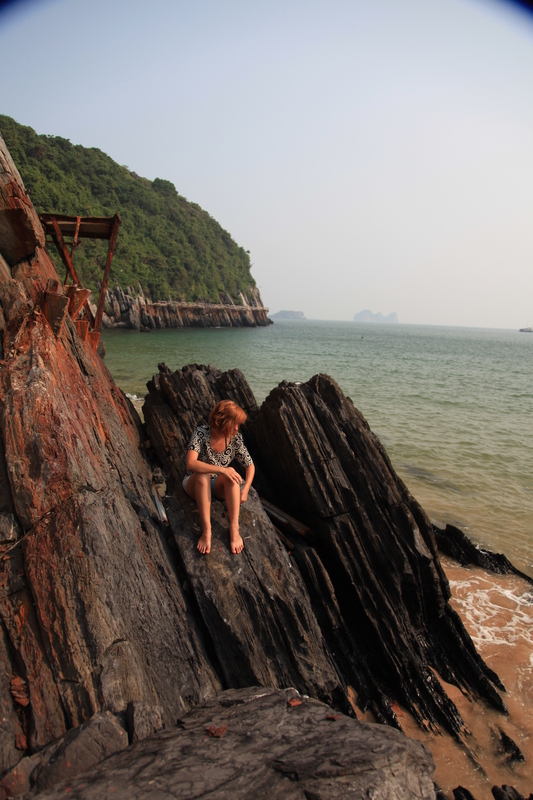 Forgotten beaches, ocean stacks, huge cliffs and endless jungle surrounding the road. We had been told that in the centre of the island was a national park and with it a beautiful view. 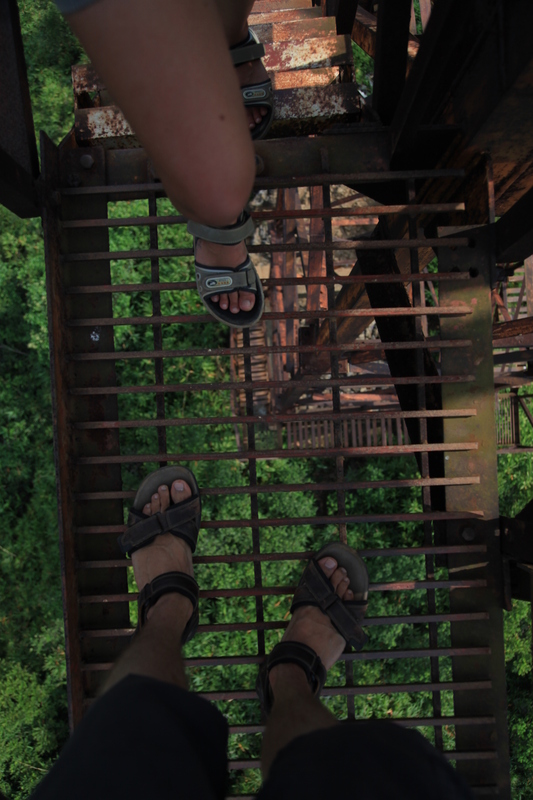 We took a narrow set of steps up the mountain; the steps became lose paving slabs, the paving slabs disappeared and became dirt and tree roots, the tree roots became rocks, the rocks became ladders. After about an hour of sweating and walking/climbing up the hill we reached the top. 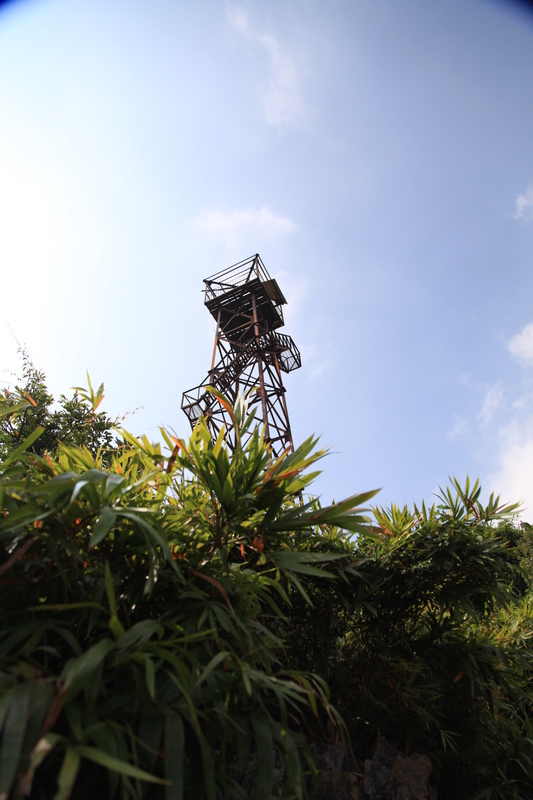 There stood a tower of rusted looking iron. Cautiously we climbed it (Clare didn’t like the height and I didn’t like the hornets flying around the top) but the view was incredible. No photo could really show the it justice, so I’ll put a video up soon. I searched for ages for this information but there seems to be very little on it. So here’s how to do it WITHOUT booking a hideously expensive tour. It costs around 190,000 Dong ($10 USD) at time of writing. Ticket price includes coaches and boat. In Hanoi go to Loung Yen bus station. 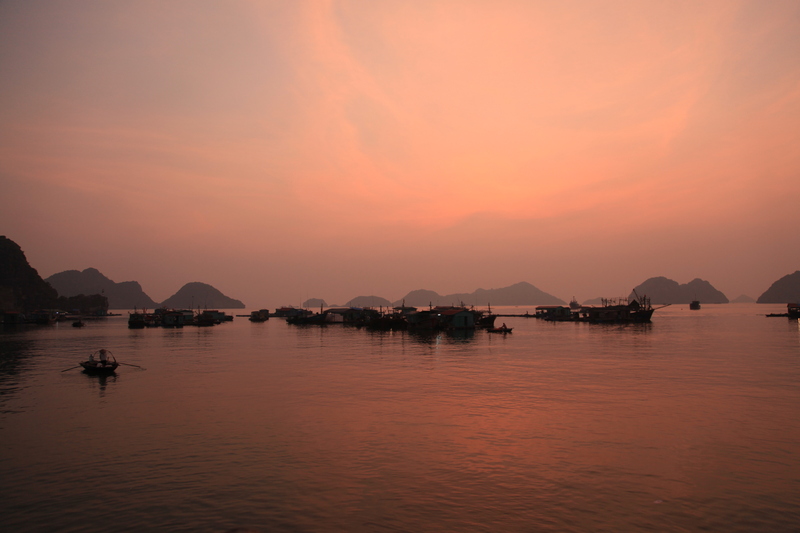 Ignore anyone asking if you want to go to Halong Bay, just say Cat Ba. In the ticket office (which is pretty modern and well kept) there should be a bus company named Hoang Long, this is the company. It seems complicated but its really well organised and you don’t normally wait in any of the change over places for very long. This is a short clip from the Ban Nam water festival. 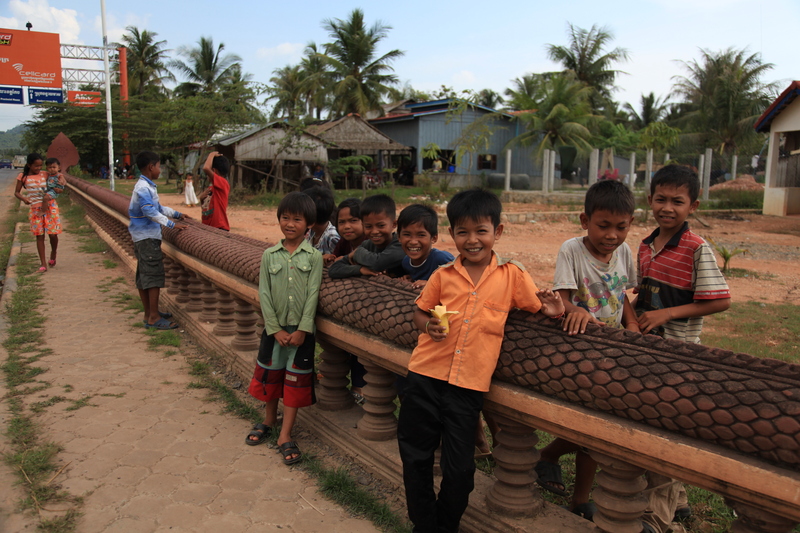 It takes place in Laos every October and is celebrated with market stalls and many boat races. 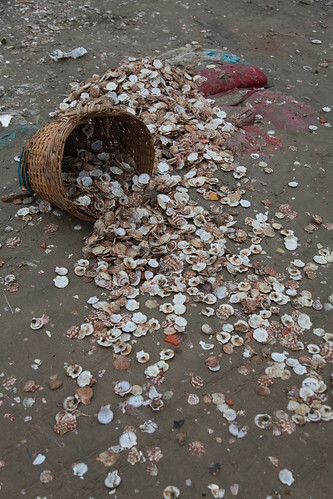 In Savaanakhet the races took place on the Mekong river.